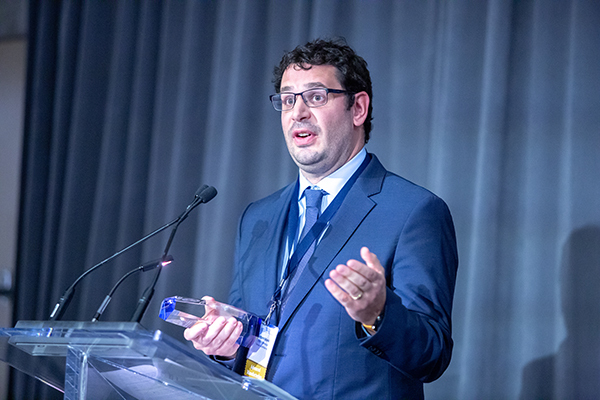 CivMin industry partner EllisDon takes home the 2018 Corporate Academic Citizen Award. 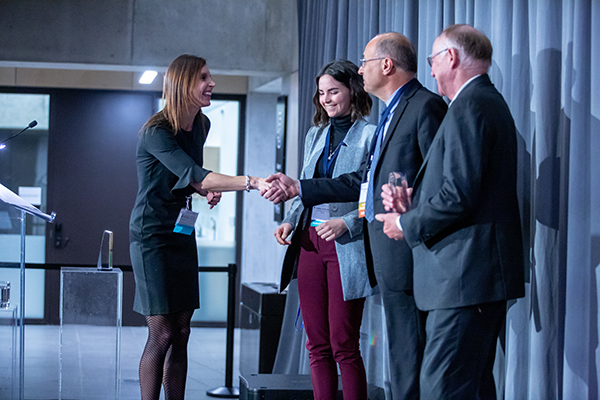 U of T Engineering recognized three key industry partners at its annual Industry Partners’ Reception on Wednesday, Nov. 14. 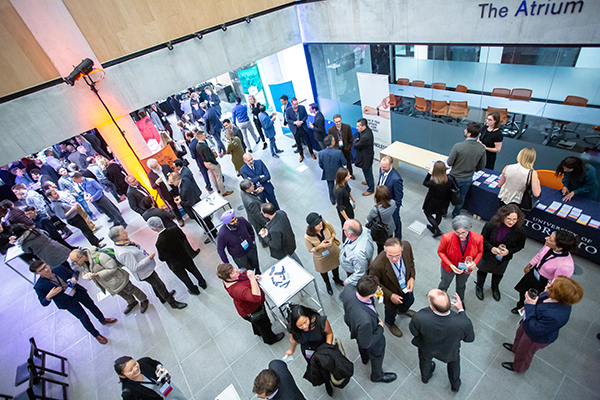 More than 180 industry leaders, government partners and faculty members gathered at the Myhal Centre for Engineering Innovation & Entrepreneurship to acknowledge this year’s achievements in academic-industry collaborations. The annual event celebrates the faculty’s ties with over 400 industry partners across multidisciplinary innovation clusters, including advanced manufacturing, data analytics and AI, human health, robotics, sustainability and water. “This event is a testament to the strength of our ongoing relationships with industry, the number of new partnerships launched this year and the momentum we continue to maintain,” says Allison Brown, Director of Corporate and Foundation Partnerships at U of T Engineering. The relationship between U of T Engineering and Fujitsu Labs started with a six-week internship by Ali Sheikholeslami at the company’s headquarters in 1998. Twenty years later, Sheikholeslami is now a professor in The Edward S. Rogers Sr. Department of Electrical & Computer Engineering, and together with his long-time collaborator Fujitsu Labs Fellow Dr. Hirotaka Tamura, has worked on projects including developing ferroelectric devices, high-speed interconnect technology and creating the world’s first Digital Annealer. In March, U of T Engineering officially launched the Fujitsu Co-Creation Research Laboratory at U of T, which is located in the Myhal Centre, to accelerate collaborative work in fields including machine learning, quantum-inspired computing, smart cities, advanced health care and financial technology. “Fujitsu Labs is working with over 10 faculty members across three departments. We have professors from electrical and computer engineering, chemical engineering and mechanical and industrial engineering so it’s a true interdisciplinary research, and for this research, we needed a home where we could come together, hence the Co-Creation Research Laboratory,” says Sheikholeslami. The lab is also an idea incubator that leverages the creativity of students and faculty. To date, the partnership has resulted in over 50 scientific papers and journals and led to 10 patents. “The research with University of Toronto is very important because if a company just focuses on the business, it tends to only look at the surface level and that’s not sustainable. We need a solid foundation to keep things going and academia is a place to build this foundation of knowledge,” says Tamura. Many large-scale infrastructure projects come with an equally large carbon footprint — but Mississauga-based construction company EllisDon is collaborating with U of T Engineering to mitigate greenhouse gas emissions and reduce the carbon impact. The project focuses on developing a decision-support tool that can be used throughout the stages of design and planning to realize efficiencies that lower climate-warning emissions. EllisDon is also closely involved in academic-industry mentorship with U of T Engineering students. “Student mentorship and teaching is an important part of [this] partnership we are committed to,” says EllisDon Senior Vice President Chris Andrews. 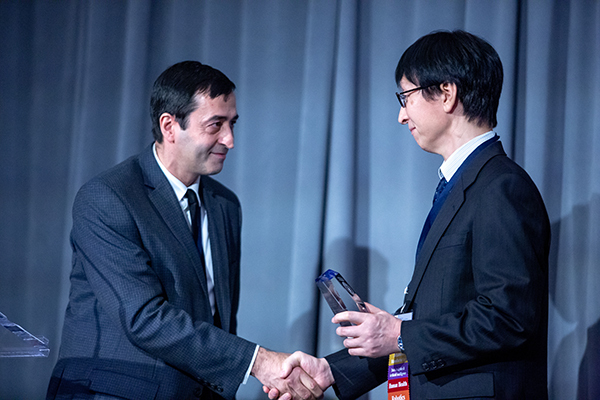 Small to Medium Enterprise Partner Award – Tenova Goodfellow Inc.
With spiking demand for electronics and other devices that rely on steel production and rare earth elements, the race to develop sustainable means of producing these materials is heating up. Tenova Goodfellow has partnered with Professor Gisele Azimi (ChemE, MSE) to develop more energetically efficient techniques for the steelmaking industry. Scipolo describes the partnership as “very positive,” yielding promising results across all objectives.